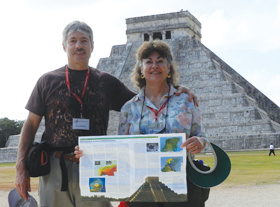 Laura Hall and Bill Di Paolo, of Di Paolo Consulting, hold up a recent ArcNews article about ancient water sources in Yucatán, Mexico, as they stand in front of a Mayan pyramid at Chichen Itza, Yucatán. The couple recently traveled through Yucatán, Campeche, and Chiapas, Mexico, on an archaeological tour of the northern Mayan kingdoms. During the trip, led by Dr. William Saturno of Boston University, they discussed the applications of GIS and remote sensing in archaeology. 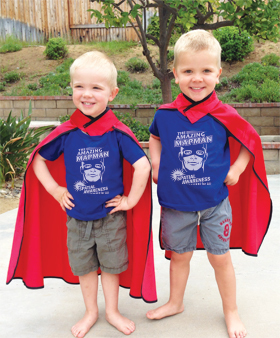 Three-year-old superhero twins Alex and Dominic Tieman don GIS T-shirts and capes to protect their neighborhood in Redlands, California.